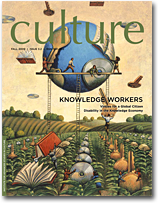 From 2007 until 2009, Culture was the Institute’s free biannual magazine that served as a site for intellectual exchange and dialogue. Authored by the Institute’s staff, fellows, and alumni, as well as guest authors, Culture created a lively forum for exploring the complex of meanings that informs and shapes our social world. Beginning with Spring 2010, Culture is now a part of The Hedgehog Review, the Institute’s award-winning journal.